If you're hot now, just wait. Canadians aren't getting much respite from the heat this weekend. By Sunday, highs across the country could hit the low 30s, with cities like Ottawa, Winnipeg, Edmonton and even Yellowknife seeing higher-than-normal temperatures. "There's never a mystery when the weather is really cold or it's really hot," says David Phillips, senior climatologist with Environment Canada. "If it's cold, you know it's coming from Canada. If it's hot, you know it's coming from the U.S."
Hot air from the Gulf of Mexico is drifting north and combining with evaporation in Canada from our moist spring, bringing about a hot, humid weekend. "For probably three-quarters of the country, it will be warmer than normal," Phillips says. 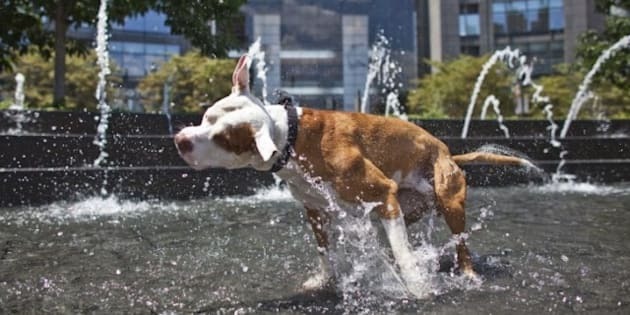 It's going to get hot in Canada, but our definition of a heat wave is nothing compared to what a heat wave looks like in the U.S. Phillips says that a traditional definition, although not official, would be three days in a row of temperatures around 32 degrees. "This would be a nice day in Dallas or St. Louis, but in Canada, it's rare," he says. "You can go some summers [in Canada] without seeing any of that." This weekend's heat could be a mere precursor to what the rest of the summer could bring. Phillips calls Saturday and Sunday's heat a kind of "rehearsal" for some of the temperatures we could see in the last week of July, which is the warmest time of the year. British Columbia, unfortunately, is part of the other quarter of Canada that isn't getting any love from Mother Nature, with cooler-than-normal temperatures across the province. Penticton native Ken Chmela says that he's used to his B.C. summers being warm and dry, not cold and rainy. "It's made it not really that great to go to the beach and that's a huge thing for Penticton." The tourism industry, he adds, has surely taken a hit thanks to rain and dark skies. "How do we brand ourselves? We brand ourselves as the sunny Okanagan, and that's not what we are right now." Industrial and residential building has also stalled thanks to rain. "Having unseasonable cold weather and rainy weather makes it difficult to build outside, especially in the summer." British Columbians can usually expect summer temperatures in mid-July to hit 35 degrees. Chmela says that this summer, the average temperature has only been between 20 and 25 degrees. The cold weather has even inspired a Twitter hashtag: #bummersummer. "They often have this expression in British Columbia called 'the June gloom,'" Phillips notes. "This 'June gloom' has been going on since March." B.C. hasn't been setting records in terms of how much rain, but with the frequency of rain. Phillips says rain has taken around 60 per cent of their days since April. "They had their monsoon season in the winter time. They expect their dry season." This weekend isn't bringing record-breaking heat, but there's still a risk of heat stroke and heat cramps. "It's a health issue mainly for young children who can't sweat like adults can[...]and also seniors who have very poor circulation," Phillips explains. He calls heat stroke "insidious," since the signs of it are similar to being under the weather. The ways to protect yourself are simple and logical: seek shade and hydrate often. "We've only reached the halfway point," says Phillips. "This is typically the torrid time of summer." So whether you're blessing or cursing the heat, you better get used to it. Unless, that is, if you're in B.C. For more details on the weather in your city, visit Environment Canada.